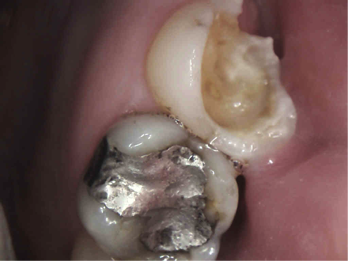 ​An Inlay/Onlay is often referred to as partial crown. When the destruction of the tooth structure has extended to an area more than ½ the width of the occlusal surface, a conventional filling cannot properly restore the tooth, then the treatment of choice would be an inlay/onlay. An inlay is done when there is no damage to the cusp, otherwise an onlay is recommended. Because these procedures need a mold to be sent to lab to fabricate into a filling material, they are also known as indirect fillings. An Inlay/Onlay can be made of porcelain, gold, or composite. However, our office prefers to use a material called e.max (please refer to e.max section of this page). 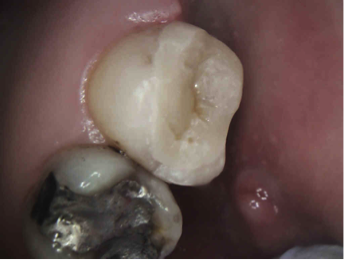 Pictured above​: Tooth #2 has extensive damage/decay which cannot be properly restored by a conventional filling.